I loved it, EXCEPT for the part where the sheep is referred to as "plump" and has the illustrator re-draw him. Seriously, does everyone in any book ever have to feel like they are "fat" and want to be "thin"? This message is so pervasive and so unhealthy for kids. Fractured fairy tales have always been very popular with my students, and I'm sure this one will be a big hit as well! Arnold is a sheep that desperately wants to be a part of this Little Red Riding Hood story. Once the author agrees, he becomes very demanding and wants to make all sorts of changes to the book. Young readers will have a lot of fun seeing all the changes Arnold wants to make. This could be a great mentor text for kids trying to make fun and creative changes to their own favorite fairy tales. The digital illustrations are bold, bright, and hilarious! This book would be awesome to have in any classroom library. 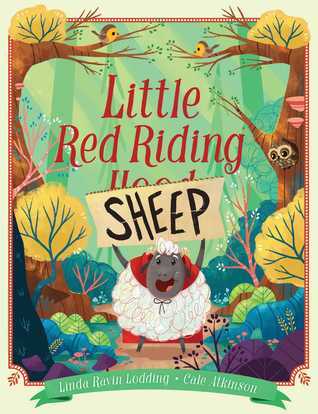 This is a really cute fractured fairy tale about a sheep who puts himself into an authors story about Little Red Riding Hood. The author and Arnold the sheep have a conversation throughout the story and Arnold is able to convince the author to include some of his other friends into the story. Kids will like this story. A modern twist on Little Red Riding Hood involves a sheep named Arnold telling the author how to improve the story. I'm sure kids will get a kick out of these humorous and demanding characters. I think Nesbit's More Bears or Chloe and the Lion are better choices for read alouds in which the characters interact with the author. Really adorable. Love the meta-fiction aspect. Great for a retold fairy tales or sheep storytime.If you like this book try Chester by Melanie Watt. It’s about an author who is writing a book about a mouse but her cat Chester keeps rewriting it. Very fun. We love retellings. This one was brought to my attention by my boss. I couldn't stop giggling and had to take it right home to X. We buddy read it several times. Hoping that she decides to rewrite other classics. Fractured fairy tales are always the best. Loved! Made me laugh out loud on more than one occasion! Any book that can do that, hands down, is a good book. funny fairy tale mash-up -- this would make great readers' theater for 2nd and 3rd graders!! A sheep wants to be in a story but isn’t thrilled that the story being read has a wolf and a scary woods. The sheep gets his friends involved too. Cute twist at the end. I liked this book. A twist on a classic fairy tale. Very silly meta-retelling of Little Red. I'm sure this would be a hit for classrooms. This was an interesting take on the traditional story. 2017 - ClassicA cute spin off on the story of Red Riding Hood with an overzealous sheep who has tons of ideas to change the story as the author writes it. The author reluctantly agrees to make the changes. This would be a cute read aloud in the primary grades. Linda Ravin Lodding - Linda Ravin Lodding is the author of "The Busy Life of Ernestine Buckmeister" (Flashlight Press, 2011) and the upcoming "Hold That Thought, Milton!" (illustrated by Ross Collins) and "A Gift for Mama" (illustrated by Alison Jay) both from Gullane Children’s Books, London. "A Gift for Mama" will be out in 2014 from Knopf/Random House in time for Mother's Day.Linda is originally from New York, but has spent the past 15 years in Austria, The Netherlands and now Sweden. Today she lives in the historical city of Sigtuna, on the edge of Lake Mälaren, with her wonderful husband and daughter (who is, at times, as busy as Ernestine) and their part-time dog Nino (who speaks Dutch, Swedish, Spanish and a smattering of English). With the publication of “The Busy Life of Ernestine Buckmeister” Linda has realized her dream to become a published children’s book author – a dream that started to take shape 13 years ago when her own daughter was born and Linda was reunited with her favorite children’s books. Some of the authors that Linda counts among her favorites are Judy Blume, E.L. Koningsberg, Madeline L’Engle and the author of the “B is for Betsy” books whose name Linda has ashamedly forgotten.In "The Busy Life of Enrnestine Buckmeister", young Ernestine’s week is chock-a-block with classes. Water ballet with Mrs. Goldfisher. Yodeling with Little Old Lady Hoo. Yoga with Guru Prakesh Pretzel. Tuba with Mr. Oompah! Ernestine is the poster girl for today’s over-scheduled child. But Ernestine is about to do something no Buckmeister has ever done before. PLAY!Like her character Ernestine, Linda has taken lots of classes – everything from Archery, Chinese Cooking, Figure Skating, Fencing, Clogging (that has nothing to do with shower drains), to Zumba. She loves dreaming up stories, biking along the canals, taking photos, doing pottery, traipsing through quaint towns, playing the flute…and sometimes just playing. Linda graduated from Barnard College, Columbia University (New York) and has an MBA from New York University’s Stern School of Business. When Linda isn’t writing, she’s usually working for the United Nations as a media and public information specialist – or eating heavily frosted cupcakes. To learn more about Linda, visite her at lindalodding, Facebook, Twitter and Pinterest.